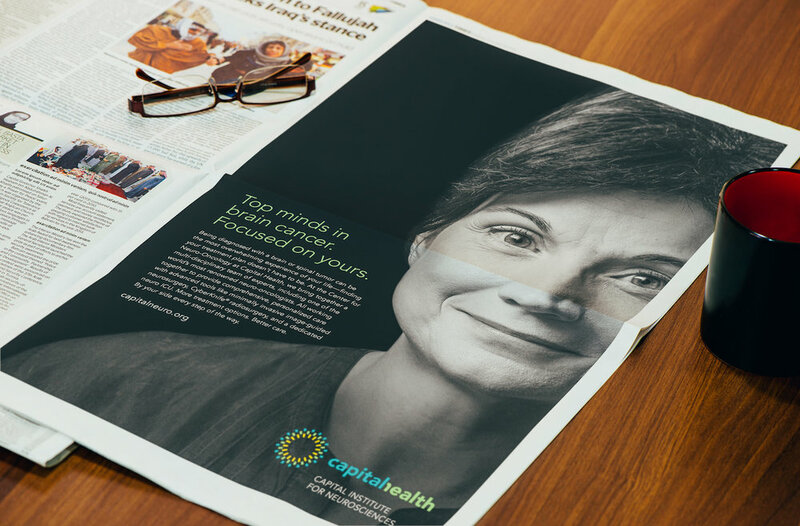 Capital Health decided to spotlight its neuro-oncology program and were seeking a sophisticated approach that highlights compassionate care for patients with brain and spinal tumors. The Neuro-oncology advertising was primarily an awareness campaign and included print ads, :30 radio spot, billboards, local train station visuals, and paid search influencing the target audience. We developed a black and white lifestyle approach that connected the expertise of the neuro-onoclogy center to the target audience. Custom photography with Steve Belkowitz allowed us to achieve a unique comforting visual approach. As an awareness campaign, it was important for the simplicity of the visuals to allow the branding and color palette to emerge.